If you'd like to help support this site, Total-German-Shepherd.com, and if you enjoy the information on this site and have found it in any way helpful, then please feel free to support our site. By doing so you'll help us keep all our German Shepherd Dog breed information here free - and up to date, for many years to come, now and in the future. I am a dog lover, especially the German Shepherd Dog, (I admit I'm biased!) and have been all my life. As a result of all my contact with these intelligent and loyal dogs I have developed a great respect for, and knowledge about, the German Shepherd. And since so much information is still unknown by the public at large about these big goofy furballs, it is for this reason that I want to share as much helpful information with you as possible. So, if you'd like to help me, and want to support this site, then please choose from one of the 5 methods below. 1. Post about this website in dog forums! 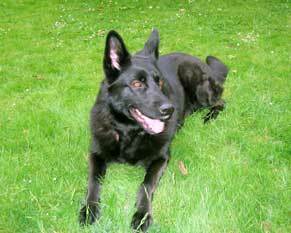 Tell forum members all about Total-German-Shepherd.com the next time you visit your favorite forum or dog groups. We appreciate you telling others about us. 2. Tell your friends, family members or co-workers all about us! If you know anybody looking for great information about purebred dog breeds like the German Shepherd Dog in particular then please send them an email to tell them about us and the information that we have to offer. 3. Link to this website on your blog or website. If you have a blog or website a link to Total-German-Shepherd.com would be greatly appreciated. Below is one banner you can use and the code for it to use. 4. Shop on this site with any of our partners. You can also support our site by purchasing any of the products featured throughout the pages of Total-German-Shepherd.com. We appreciate all your help and your visits to our site. Thanks for joining us in our love and support of the German Shepherd Dog!